1867, 3¢ rose, C. grill, o.g., virtually perfect centering within evenly balanced margins, strong vibrant color and very fresh, well defined grill impression, Extremely Fine and choice; with 2014 P.F. 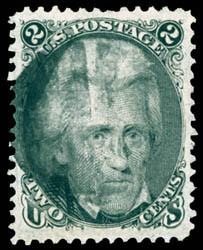 Graded certificate (XF 90 XQ, SSV $13,000 for 90). A WONDERFUL MINT GEM EXAMPLE OF THE 1867 3¢ C. GRILL ISSUE. 1867, 3¢ rose, D. grill, neat fancy circle of diamonds cancel, well centered amid large oversized margins, bright vibrant color, Very Fine to Extremely Fine, a gorgeous large margin stamp; with 2015 P.F. Graded certificate (VF-XF 85, SSV $1,450). 1867, 2¢ black, F. grill, cork cancel, exceptionally well centered within large oversized and beautifully balanced margins, deep color and crisp impression, Extremely Fine to Superb, a wonderful superb used gem. AN OUTSTANDING LARGE-MARGIN EXAMPLE OF THE 2¢ BLACK JACK F. GRILL. 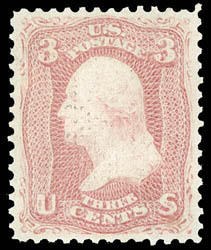 1867, 5¢ brown, F. grill, o.g., never hinged, rich bold color and exceptional freshness, just in at bottom and perfs just touching at right, full strong grill impression, Fine and attractive; with photocopy of 1999 P.F. certificate for block. Scott No. 95 $3,500 for hinged. A VERY RARE SOUND NEVER HINGED EXAMPLE OF THE 1868 5¢ F. GRILL ISSUE. Approximately ten never hinged examples exist today in never hinged condition. Of these, many have perfs cutting well into design or are faulty. 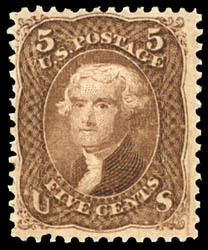 1868, 5¢ brown, F. grill, o.g., never hinged, wide margins and far better centered than normally encountered on this issue, rich vibrant color, full strong grill impression, remarkably fresh and F.-V.F. ; with 1977 P.F. and 1990 P.S.E. certificates. ONE OF THE FINER SOUND NEVER HINGED EXAMPLES OF THE 1868 5¢ F. GRILL OF THE VERY FEW THAT ARE IN EXISTENCE. 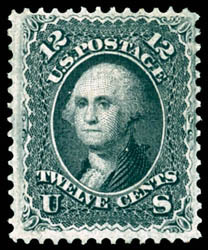 1868, 12¢ black, F. grill, o.g., lightly hinged, deep bold color and detailed impression, attractive centering within wide margins, fresh and Very Fine; with 2001 and 2008 P.F. certificates. A HANDSOME AND SCARCE SOUND MINT EXAMPLE OF THE 1868 12¢ F. GRILL ISSUE. 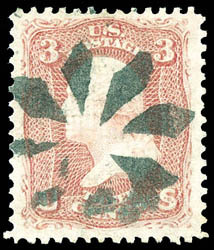 1867, 15¢ black, F. grill, o.g., lightly hinged, a remarkably fresh single, well centered within nicely balanced margins, beautiful bold color and impression on very thin paper (not mention on cert. ), clear well defined grill impression, Very Fine to Extremely Fine; with 2015 P.F. 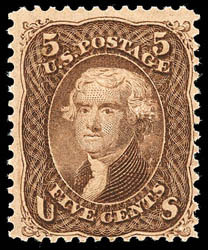 Graded certificate (VF-XF 85, SSV $7,500). 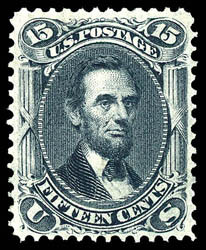 A WONDERFUL MINT EXAMPLE OF THE 1867 15¢ BLACK F. GRILL ISSUE. 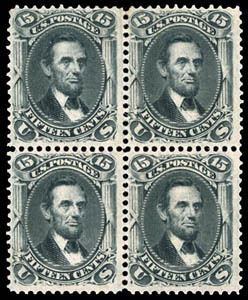 1867, 15¢ black, F. grill, block of 4, full o.g., attractive centering, rich deep color on bright fresh paper, well defined grill impressions and strong intact perfs, F.-V.F. ; with 2013 P.S.E. certificate. ONE OF THE FINER MINT MULTIPLES OF THE 1867 15¢ F. GRILL ISSUE - RARE IN SOUND INTACT CONDITION. Many mint multiples still exist today, however most are plagued with either poor centering, perf separations or a myriad of faults. Sound intact examples like this example are truly rare.